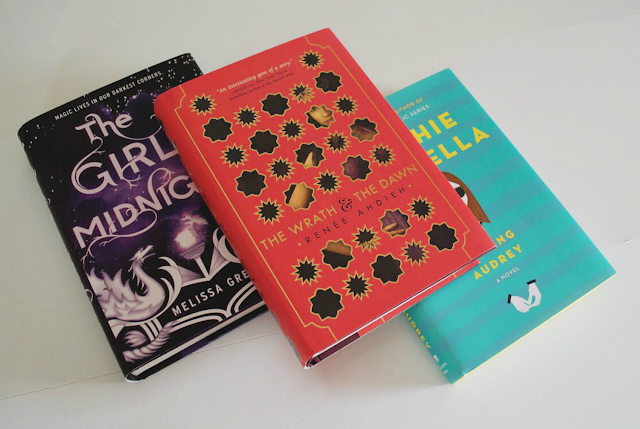 Last month I wrote a review on Uppercase Box, which is a subscription box for all the 'Young Adult' book readers out there. I was happy to share all about it because I'm still enjoying my subscription with Uppercase a lot. I didn't share a review on the actual books that I received those past 3 months in the previous post, and I really wanted to do a separate review on them for you now. One of the many reasons why I enjoy my subscription with Uppercase Box is because you never know exactly what kind of book will be the new month's pick. All of these books are so different from one another, and I love that. They have challenged me to step out of my comfort zone - I used to only read either popular books, or most YA dystopian stories, and that's it. Now, my mind is open to almost anything - such as fantasy or a memoir. 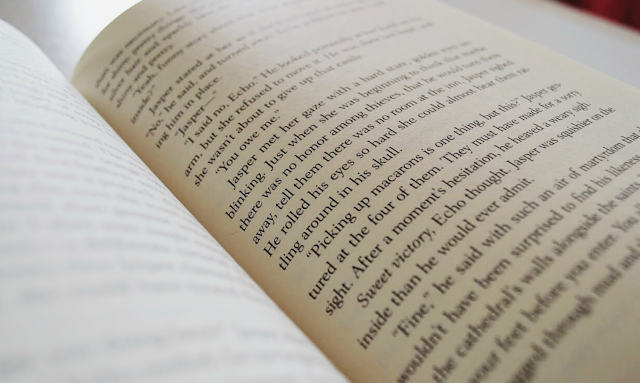 I've really been able to find the beauty in reading since I opened up my mind to new worlds and experiences. I hope that you enjoy my thoughts on each of these books, and if you've read any of them I hope you share your own thoughts with me as well. "Memories make us who we are," he said. "Without them, we are nothing." Goodreads Summary // Beneath the streets of New York City live the Avicen, an ancient race of people with feathers for hair and magic running through their veins. Age-old enchantments keep them hidden from humans. All but one. Echo is a runaway pickpocket who survives by selling stolen treasures on the black market, and the Avicen are the only family she's ever known. Legend has it that there is a way to end the conflict once and for all: find the Firebird, a mythical entity believed to possess power the likes of which the world has never seen. It will be no easy task, though if life as a thief has taught Echo anything, it's how to hunt down what she wants. . . and how to take it. 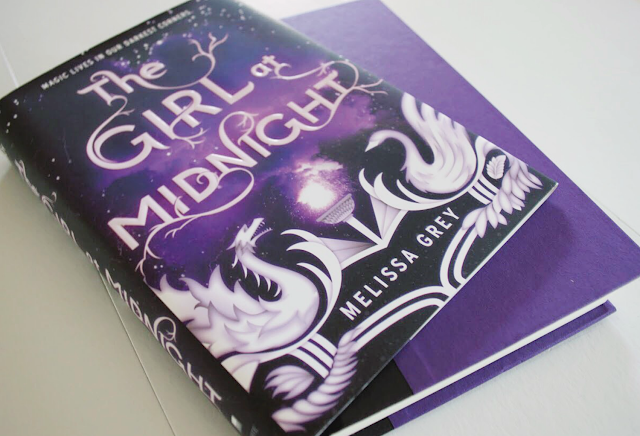 Melissa Grey does a great job building this fantasy world. The book started off a little slow to me. I wasn't completely in love with the story at first, and I couldn't connect with Echo in any way. I did find the world and their ancient history of the Avicen and Drakharin - who are at war in the fantasy world, while mortals are unable to see any of this going on - and I thought that was interesting enough to keep me reading. Like I said, I found it hard to connect with Echo who is our main character in the story. It's not that I didn't like her - I just wasn't interested in her as much as I would hope I would be. Once we got to our other POV - told from Caius, the leader of the Drakharin, I was sold on his character. I have read some reviews where others have thought the supporting characters were a bit flat or unnecessary, but I couldn't disagree more. I enjoyed all the characters and thought it was fun to see all these different types of people come together to find a solution to this war going on around them. By the end of the book I was rooting for Echo, I enjoyed seeing her character develop into a strong and fierce leader. I really love Melissa's style of writing. While I was reading this book it reminded me of reading 'The 5th Wave' series by Rick Yancey, whose writing I absolutely love - so it was a lot of fun getting all the different POVs of the story and seeing them all tie together. This was the first book that I ever read that contained a strong fantasy element, and I was honestly shocked at how much I enjoyed it. So, I think this book is great for any fantasy book lovers out there as well as anyone looking to broaden their reading selection. The world building is a lot of fun to read and the story really picked up in the middle - ending of the book. Personally, I'm excited to see where Echo and her friends go in the next one. "Some things exist in our lives for but a brief moment. And we must let them go on to light another sky." Goodreads Summary // In a land ruled by a murderous boy-king, each dawn brings heartache to a new family. Khalid, the eighteen-year-old Caliph of Khorasan, is a monster. Each night he takes a new bride only to have a silk cord wrapped around her throat come morning. When sixteen-year-old Shahrzad's dearest friend falls victim to Khalid, Shahrzad vows vengeance and volunteers to be his next bride. Shahrzad is determined not only to stay alive, but to end the caliph's reign of terror once and for all. Night after night, Shahrzad beguiles Khalid, weaving stories that enchant, ensuring her survival, though she knows each dawn could be her last. But something she never expected begins to happen: Khalid is nothing like what she'd imagined him to be. This monster is a boy with a tormented heart. Incredibly, Shahrzad finds herself falling in love. How is this possible? It's an unforgivable betrayal. Still, Shahrzad has come to understand all is not as it seems in this palace of marble and stone. She resolves to uncover whatever secrets lurk and, despite her love, be ready to take Khalid's life as retribution for the many lives he's stolen. Can their love survive this world or stories and secrets? 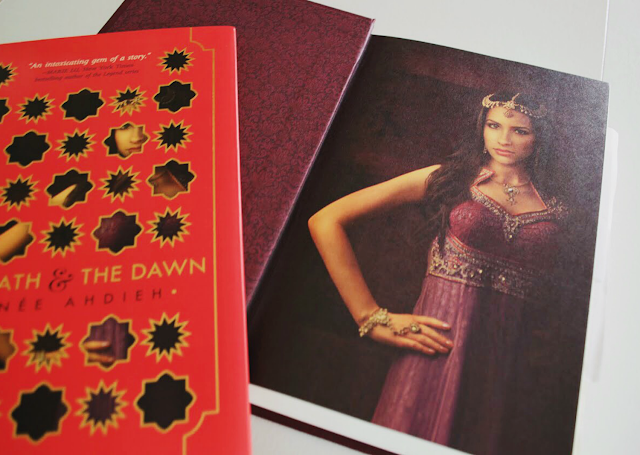 Inspired by 'A Thousand and One Nights', The Wrath and The Dawn is a sumptuous and enthralling read from beginning to end. Since finishing reading this book, I have recommended this book over and over again. 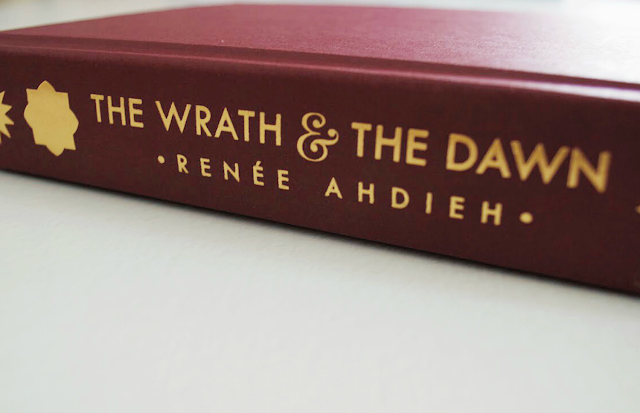 'The Wrath and the Dawn' is my favorite book release of 2015 so far, and I've read a lot of best selling books this year. I have never read 'A Thousand and One Nights' before receiving this book, so I had no idea what kind of story this was going to be. I honestly wasn't even looking forward to reading it because it wasn't a book I would have ever bought for myself. But - I was so, so wrong. 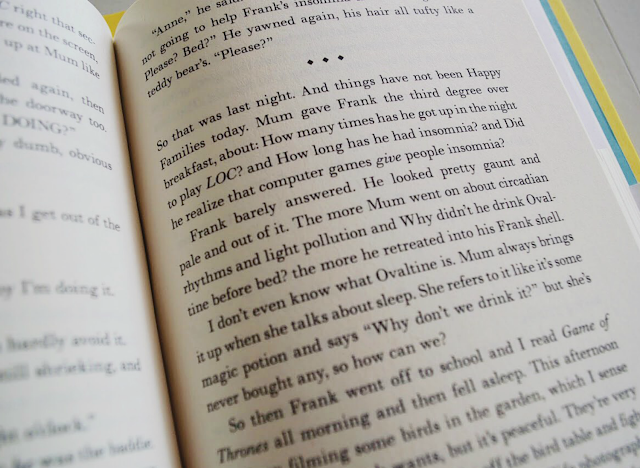 There wasn't one thing I didn't enjoy about this book. The world Renee builds is absolutely stunning. She writes so beautifully - in a way that you feel like you are there, walking the marble floors and eating the delicious food being served. The descriptions are so fun to read in this world - the palace, food, and everything that surrounds the story. Again, in this book we get different POVs - of course our main character is Shahrzad who is a strong young woman with all the right qualities we hope for in a heroine, and then there is Khalid who is this interesting young prince who you can't get enough of. Then, there are all the supporting characters who have just as interesting of a background as our main characters. I enjoyed getting to know more about each character as the story progressed. Renee gives glimpses of the world outside of the palace as well, where Shahrzad and Khalid are, to our other characters and it all ties in together well at the end. If you love a good romantic story - with just the right amount of action and magic/fantasy - then this is the perfect book for you. There's so much mixed in this book that it's hard to categorize it as a certain genre. I'm really looking forward to the next book.. because that ending was ahhh! "I think what I've realized is, life is all about climbing up, slipping down, and picking yourself up again. And it doesn't matter if you slip down. As long as you're kind of heading more or less upwards. That's all you can hope for. More or less upwards." 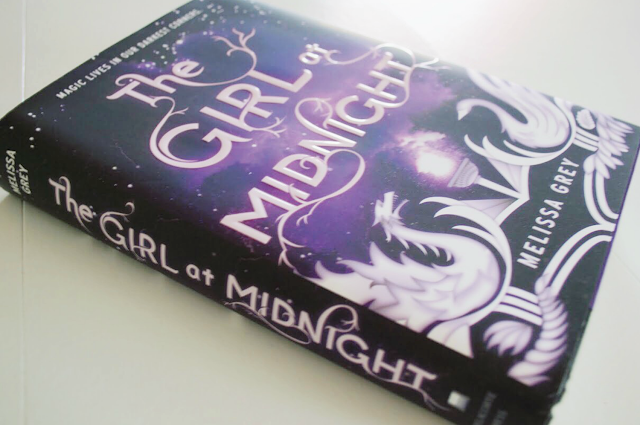 Goodreads Summary // An anxiety disorder disrupts fourteen-year-old Audrey's daily life. She has been making slow but steady progress with Dr. Sarah, but when Audrey meets Linus, her brother's gaming teammate, she is energized. She connects with him. Audrey can talk through her fears with Linus in a way she's never been able to do with anyone before. As their friendship deepens and her recovery gains momentum, a sweet romantic connection develops, one that helps not just Audrey but also her entire family. Audrey is one of my favorite characters I've ever read about. I thought it would be hard to connect with a 14 year old girl when I'm a 25 year old, but I felt an instant connection to Audrey. As someone who suffers from anxiety myself, I just felt for her as I relived all the emotions she felt throughout the story. I never stopped rooting for her. This is such a heartwarming story for me. Her family is just so realistic - they are a little bit crazy and dramatic, especially her mom, but in a home full of problems the thing that holds them together is the love they all have for each other. It's especially beautiful to see how much Audrey's family cares and supports her throughout her journey. I have read several reviews where people think Sophie was making mental illness come off as a joke, some were even offended by the book. 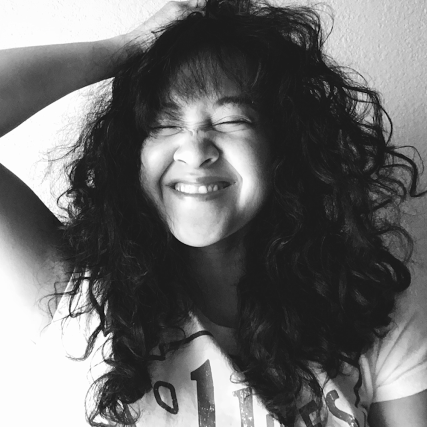 There was no point in the story where I ever felt offended - there was a comedic relief and some romance throughout the story, but it was written throughout with good intentions and was enjoyable. It never felt forced - and I thought that was important. 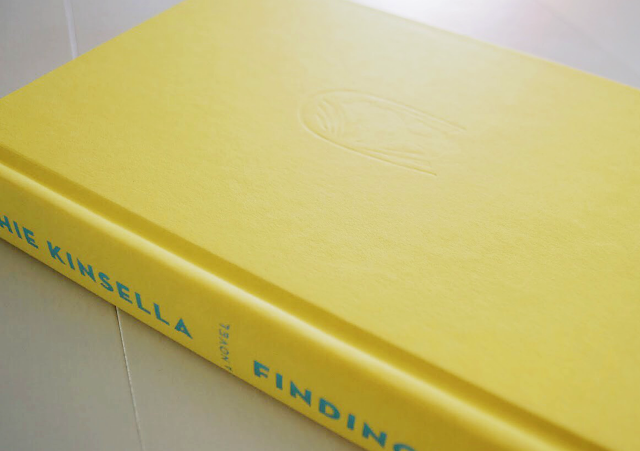 'Finding Audrey' is a really great, quick read. I laughed and I cried, and the little romance in the story was adorable. 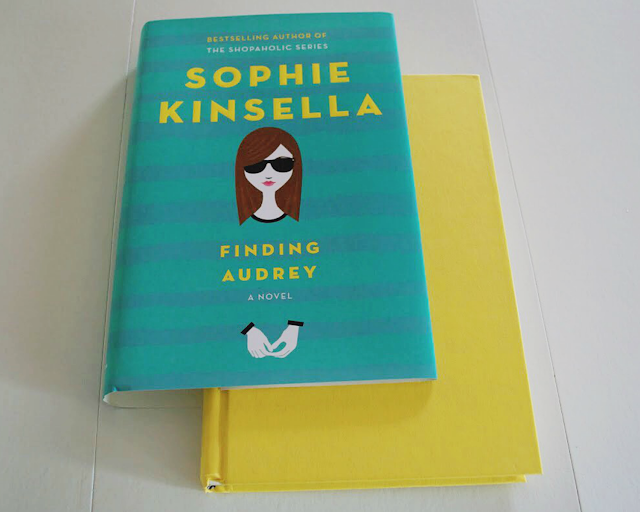 It was my first Sophie Kinsella book and I'm glad I had the chance to finally read her fun writing. Didn't I tell you all of these books were completely different from each other? They were all so great in each of their own worlds! I really love the variety of books selected each month by Lisa at Uppercase Box. If you have read any of these books, then join me and leave your own thoughts about any of these stories. 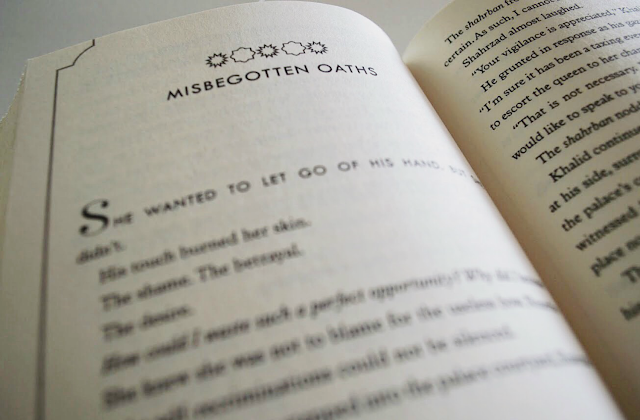 Tell us what you thought, loved, hated, or anything you took away from the book.